Chef Tso Kim Fu arrives beaming with a tub of glistening silver fish. Setting it down, he greets us warmly. I’m at the Renaissance, Mumbai, preparing for a Verve cook-off between Chef Tso Kim Fu, Head Chef of the Chinese restaurant Emperor’s Court and Chef Enrico Luise, Head Chef of the Italian restaurant Fratelli Fresh at the same hotel. Fresh local sea bass is on the menu today. Chef Luise and Chef Tso are asked to give this fish their unique signature. My only requirement: To keep the dish simple yet full of flavour. I want our readers to be able to follow the recipes at home. Chef Luise is making Branzino Alla Livornese, a pan-fried sea bass with capers and tomatoes. He starts salting the sea bass. Sea bass in India? I’m puzzled. Does this fish have a different name here? Chef Luise says no. Sea bass is caught locally in the Arabian Sea. The fish came from the Sassoon Docks that morning. Chef Luise sprinkles rock salt and lemon over the fish. He then sautés the fish mildly with Liguria, an extra virgin olive oil and puts it in the oven for a few minutes. Now he starts assembling ingredients for the pan. Tomatoes, basil, potatoes – the produce is fresh. I’m starting to get a feel for his style. Looking barely 30, Chef Luise has immense vision and expertise in the world of haute cuisine. Beginning his career in Verona, Italy, he has worked at some of the finest restaurants in Italy, Spain, the Bahamas and England. His stint as the Head Chef in Uno Restaurant, Pimlico and as the Senior Sous Chef in Neal Street Restaurant, Covent Garden, London, marks a very cosmopolitan streak in him. Joining the Renaissance, Powai as the Head Chef for Fratelli Fresh, he immediately set out to growing his own herb and tomato garden for the restaurant. Across the Renaissance property are patches of Chef Luise’s herbs and tomato vines. Italian food without fresh herbs and ripe tomatoes is like Indian food without spices, he declares. I agree. As our team sets up the camera and lights, trays start arriving with ingredients for Chef Tso. Stalks of lemongrass, twigs of cinnamon, little ramekins with star anise, velvety plum sauce, shimmery sweet chilli sauce and a couple of long and silky banana leaves. Chef Tso starts layering the fish on the banana leaf with lemongrass and cinnamon. Brushing the fish with the sauce, he tops it off with the fragrant star anise and puts it in the oven. Chef Tso is making Baked Sea Bass in Lemon Chilli Sauce. Why is he baking and not steaming, I ask. Indian palates are not used to steamed fish that goes with traditional Chinese food, he says. The bake would give keep the fish moist yet full of flavor. Well, if the Indian palate wants food well cooked, why not pan fry the fish? Wait and see, he tells me. Chef Tso understands the nuances of the Asian palate. Growing up in Singapore, he was privy to a pan-Asian culinary tradition. With over 35 years of experience in Chinese, especially Cantonese cuisine, Chef Tso has worked at some of the finest hotels and clubs around the world including the Capital Club, Beijing and the Pearl Room, Singapore, in executive positions. The stage is now set; the pans are heating up on the stove. Tomatoes and capers, basil and potatoes are being sautéed in the pan by Chef Luise. On the second stove, Chef Tso starts sautéing his fish. A gentle chiding by Chef Luise and Chef Tso increases the fire in his stove. Playful camaraderie bordering on machismo ensues between the two chefs. A ‘faster, bigger and better fire flashing in the pan’ contest. Voila, a few minutes later, the dishes are ready. 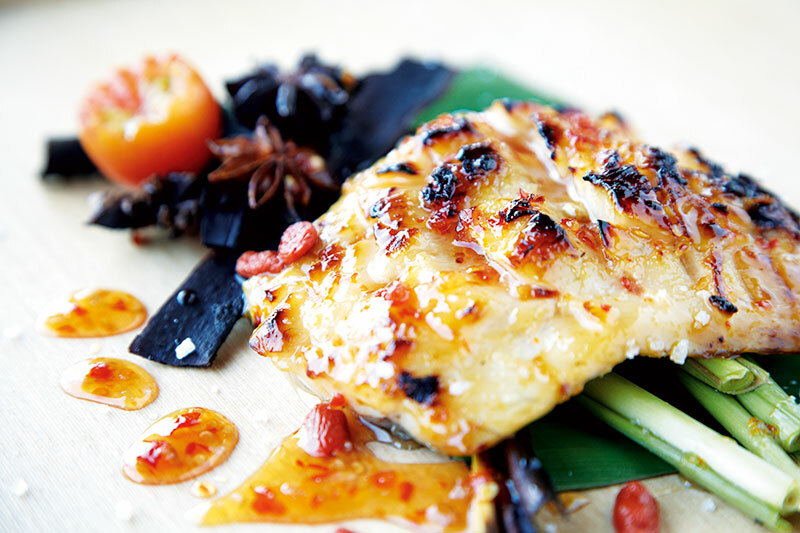 The lemongrass baked fish is glazed, moist and tickles the buds with its chilli lime flavor. Hinting at a Singaporean-sweet-chilli fused with a Thai-lemongrass flavour, Chef Tso’s creation is healthy and great with jasmine rice. Chef Tso shows me his pan-fried fish. Compared to the bake, which has an orange glaze, the colours of the fried fish have dulled to an unappetising brown. The bake is still moist and tender; the pan fried is dry and greasy. Baked is definitely the way to go. The Branzino Alla Livornese created by Chef Luise is a complete meal in itself. The fish is fresh and full of flavour, the herbs and the Liguria bring a piquant touch, the potatoes add heartiness and the juicy tomatoes create a sauce truly befitting a robust Italian meal. A chilled bottle of dry white Pinot Grigio complements the entree beautifully. As I bid goodbye to Chef Tso and Chef Luise, I feel pleased I have just sampled not one but two unpretentious yet luxurious meals. 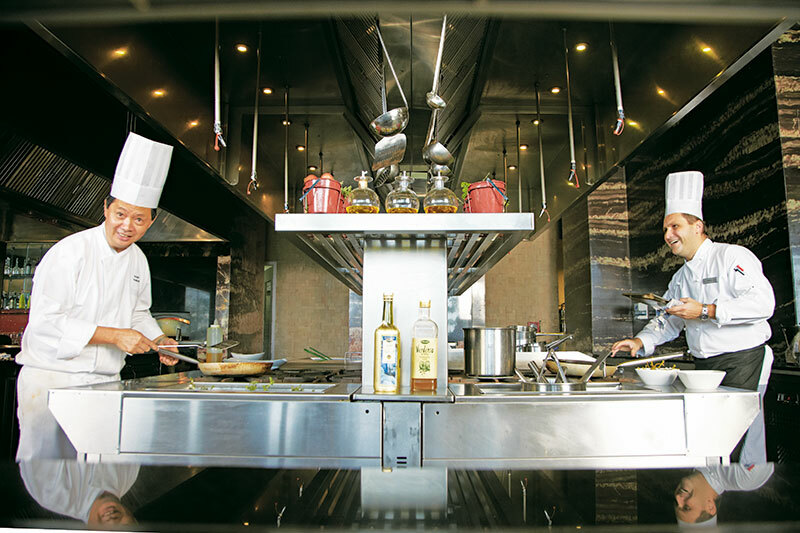 Both the chefs have displayed a passion and flair truly befitting the great culinary traditions of the East and the West. 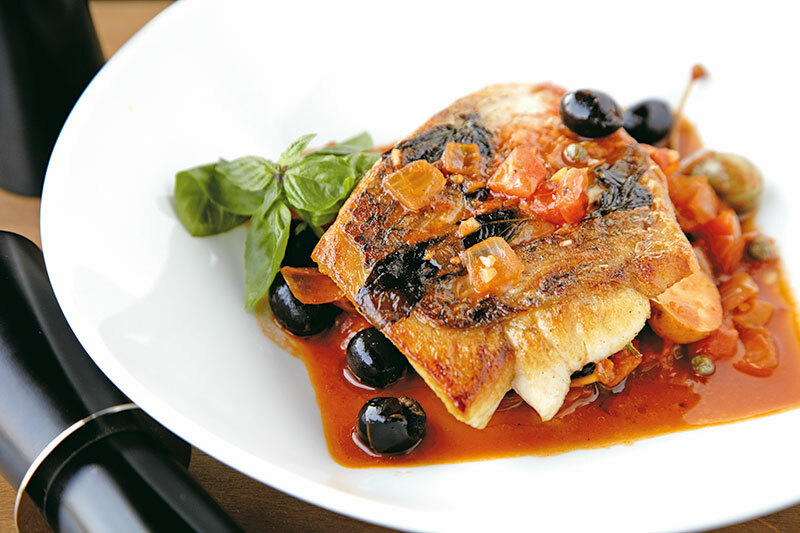 Ingredients: Sea bass, 200 gms; Plum tomatoes (diced), 60 gms; Tomato juice 150ml; Black olives, 20gms; Caper, 3gms; New potato cubes, 120gms; Olive oil extra virgin, 40ml; Fresh basil, 4gms; Fresh onion, 30gms; Salt and pepper to taste. Method: Clean and scale the sea bass. Shallow fry the fish in olive oil. When the skin is golden and crispy, take the fish and put it in the oven for four minutes at 180 degrees. Meanwhile add the onion to the pan and roast till golden brown. Add plum tomatoes, olives and caper. Roast for a few minutes. Add new potato cubes and tomato juice. Add the fish to this mixture. Finish the sauce with fresh basil. Ingredients :Fresh sea bass, 400 gms; Sea salt, 100 gms; Fresh lemon 3; Lemon grass, 100 gms; Coriander, 75 gm; Banana leaves, 50 gms; Lemongrass 100 gm; Fish sauce 150 gm; Plum sauce 100 gm; Oyster Sauce 50gms; Red chilli 30 gms. Method: Clean the fish, debone and cut into fillets. Combine sea bass, sea salt and lemon; marinate for 20 minutes. Layer the fish on the banana leaf with the lemongrass and star anise. Brush the sauce on the fish. Transfer sea bass to a baking tray and bake in an oven at 150 degrees for ten minutes. Reduce to 100 degrees and bake for another ten minutes. Garnish fish with pieces of lemon.